Saniserv is the leader in the soft serve ice cream and yogurt business. “Founded in 1929, Saniserv® began as a manufacturer of amusement park equipment in Indianapolis, Indiana. Two years later, they made the very first frozen custard machine. Saniserv products paved the way for food service automation, contributing to the 1950’s fast food boom. Simplistic design, rugged construction and continuous improvement put Saniserv® at the forefront of the frozen dessert and drink marketplace.”1 When purchasing a soft serve ice cream / frozen yogurt machine consider all possible options. Frozen yogurt shops are becoming increasingly popular. Frozen yogurt is a tasty and healthy snack for men and women of all ages. Top manufacturers in the soft serve ice cream and frozen yogurt field is SaniServ, all of their products include full warranty and have proven to last. A soft serve machine will prove to be a money-generating machine for any food service business. Distributors such as Elite Restaurant Equipment offers many different types of Saniserv units. 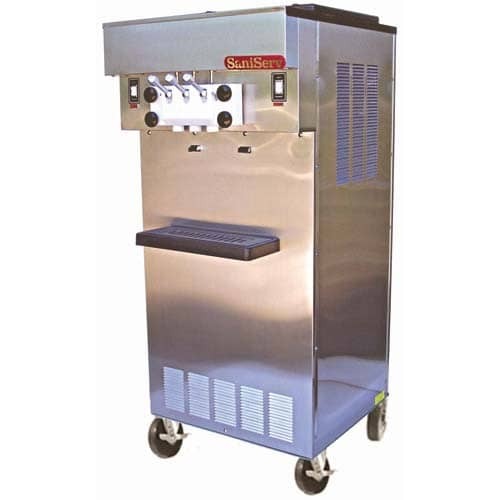 Once one comes to the undeniable fact that Saniserv is the only brand to use in purchasing a soft serve ice cream, yogurt, or milkshake maker, the next decision to make is what type of unit you need to purchase. One of the most important factors you must determine before purchasing the appropriate Saniserv unit is the amount of ice cream or yogurt you may need to yield per minute. Saniserv units are available in low, medium or high volumes. Each volume is measured in a per minute value. For example Saniserv low volume units can produce either two-3oz servings of product per minute or two-4oz servings per minute. Medium volume units can be defined as two-12oz servings, three-12oz servings, five-4oz servings, four-4oz servings and three-12oz servings. High volume Saniserv units can be defined as five-16oz servings, seven-4oz servings, ten-4oz servings and fourteen-4oz servings. Another important aspect to consider is how many different flavors do you wish to have featured on a machine. Saniserv offers machines with one, two and three flavors. The two most popular flavors of any ice cream or yogurt are vanilla and chocolate. Often retailers use the third flavor to create a swirl or twist by combining the best of both worlds. You may also use this third flavor to make a flavor of the month. One good suggestion is to make these flavors seasonal. For example maybe in March you have a chocolate mint ice cream green in color for St. Patrick’s Day. Size is also an important thing in determining the ideal Saniserv unit. Saniserv units are available anywhere between 14’’-26’’ in width. The Height of these units can vary between 25.5’’-61.5’’. Finally the depth of these units can range between 23.75’’-32.5’’. Often these units are conversely associated with the volume size and the amount of cups produced per minute. Saniserv does not only offer soft serve yogurt and ice cream machines. They also offer milk shake machines and batch freezers. Saniserv batch freezers are available in either a five or ten quart capacity. The five quart freezer has dimensions of width 17’’, height 30’’ and depth 24’’. The ten quart unit has dimensions of width 21’’, height 50.5’’ and depth 32.5’’. Saniserv milk shake machines are available in two high volume units. Each one of the units produces five-16oz shakes per minute. One of the units has the ability to store two flavors. 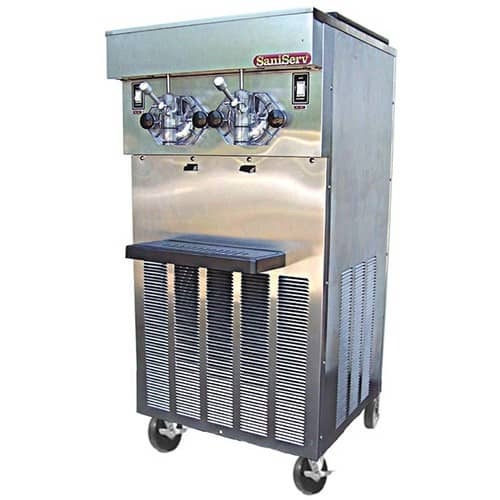 The one flavor milk shake machine has dimensions of width 17’’, height 57’’ and depth 25’’. The two flavor unit has measurements of width 26’’, depth 54.75’’ and height 28’’. As many retailers know many times dessert is an excellent way to make money. These units cannot only benefit any frozen yogurt or ice cream store, but also any restaurant, club, hotel, or retailer. Before deciding which Saniserv unit is right for your business there are several things you must consider. First the amount of volume your unit needs to produce is an important factor. 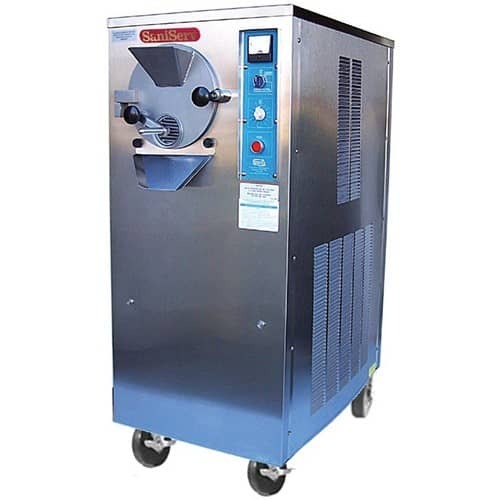 If you are only a frozen yogurt or ice cream shop you may want to purchase a higher volume-yielding unit than if your just going to serve it in a diner lets say. Secondly how many flavors does your unit need to dispense at a time. Lastly how big of a unit are you looking for it is important to measure correctly. Saniserv is the clear choice for tasty soft serve treats with high yielding profits.